Yamada Fuji (山田富士) is one of Fuji Zuka in Yokohama. In early 19th century, Yamada Fuji was already built in this spots. It has 30 m high and the entire park is designed the actual Mt. Fuji and forest. There is a pond which represent Fuji Lakes, and There are two path to reach the top. One in east is called Gotenba, and the other in south is called Yoshida. The slops and the shape are the same as the Mt. Fuji. ... is artificial Mt. Fuji made for the faith of Mt. Fuji. 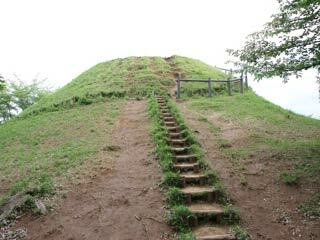 Most of the Fuji Zuka are built during the Edo period, and some of them has Sengen Shrine at the top of the hill like Mt. Fuji. Fuji Zuka is considered as the power spots which you can gain the great power of the nature.